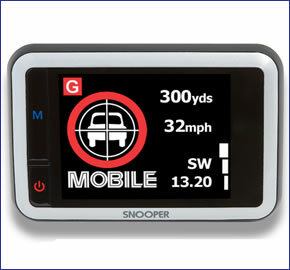 Snooper Lynx GT LIVE speed camera detector is a 'LIVE' product, this means that it will automatically update as you drive along thanks to built-in GPRS/GSM "mobile phone" technology. The Lynx LIVE provides alerts to both fixed and mobile speed camera locations such as Gatso and SPECS cameras. Plus mobile sites can be reported and relayed to the AURA Live database simply by pressing the 'Target' button on the Snooper Lynx GT. The Lynx GT is designed to be windscreen or dash mounted and its 2.7-inch full colour TFT LCD screen displays and spoken voice alert provide all the warnings. Subscription charges apply after the initial first 12 months which are included, these are £7.99 a month, £22.99 a quarter or £86.99 a year. Snooper Lynx GT LIVE has been discontinued. Snooper Lynx GT speed camera detector uses GPS and GPRS/GSM (mobile phone) technology to provide advanced warnings to speed camera locations via an airtime contract. The unit can be powered either via your vehicles car charger or via the built-in rechargeable battery - which provides up to 3 hours operation during normal use. Alerts on the Lynx GT are given both audibly from spoken voice alerts and via the 2.7-inch full colour TFT LCD colour display so you always know what lies ahead. What makes the Lynx GT unique is that the speed trap data is fed from the AURA live database - the ONLY system from Snooper that gets its speed trap data like this - faster than any other Snooper GPS device, as you drive and without the need of a PC! Snooper Lynx GT LIVE comes complete with 12 months subscription to the AURA Live speed camera database - offering a saving of up to £36.99 off the normal annual charge when purchased separately. Subsequent subscription is charged at £7.99 a month, £22.99 a quarter, £86.99 a year. Snooper Lynx GT is a 'LIVE' product and just like many mobile phones it uses GPRS/GSM technology to wirelessly connect to the network. The network in this case being the Snooper AURA LIVE speed camera database. When using the Lynx GT LIVE in your vehicle it periodically connects to the AURA LIVE database adding (or removing, if relevant) speed camera locations within a 10 mile radius to a temporary database. Should you be driving in an area with a poor or no GPRS signal, then the Lynx GT will default to the preloaded database. ActiveGPS therefore recommends that you perform a database download from time-to-time using a Windows PC (not Apple MAC), which will permanently update the preloaded database. The 'LIVE' and connected AURA Live database works both ways - from Snooper and also back to Snooper. So It's also possible for motorists using the Lynx GT to add new and live mobile sites that they spot on the UK's roads. By pressing the large 'Target' button on the front of the Lynx, a mobile speed trap site is added to the AURA Live database and remains there for the following 6 hours. Snooper Lynx GT also operates as a portable tracking system. Using the airtime contract it is possible to track the position of your Lynx GT anytime the unit's switched on. It is also possible to view current as well as historical journey reports and other useful information including average speed and daily, weekly and monthly mileage. The Snooper Lynx GT, like all Snooper 'LIVE' products, gets it speed trap data from the Snooper AURA Live speed camera database. The database which is sent automatically to the Lynx GT provides advanced warnings of both fixed and mobile speed camera locations across the UK, Europe and in a growing number of other countries across the World. The database is constantly updated with the latest locations. Click here to read more about the AURA Live speed trap database. Do you have a question about the Snooper Lynx GT LIVE that's not been answered on this webpage? Please see our speed camera detector FAQs for questions from other customers and visitors. Plus if the answer to your question isn't featured, use the online form to ask us for the answer. Alternatively please telephone 01733 777623 Monday to Friday (9:30am-5:00pm) to speak to one of our sales team. Snooper Lynx GT can be installed in seconds and can be moved easily from vehicle to vehicle. Simply mount the Lynx GT on the dashboard or the on the windscreen with the mounting brackets provided. Power it from the cigarette lighter socket, switch it on and you're ready to go! To provide you with up to the second, automatic speed camera updates Snooper Lynx GT requires an airtime contract (UK ONLY). There are 3 easy ways to pay using a credit or debit card. Minimum contract 12 months. Airtime contract provides 'LIVE' provides with real-time fixed speed camera alerts and updates. Please note: Snooper 'LIVE' products, like your mobile phone will not operate without an airtime contract and is currently for UK USE ONLY with the above subscription. For use outside of the UK an additional subscription is payable on a monthly basis, plus roaming charges will apply. Please note: Snooper Lynx GT units will take up to 48 hours to be activated following registration. Units registered during or before the weekend may take longer. It is fully legal to use a speed camera detector in the UK. However, before using the Snooper Lynx GT LIVE outside of the UK we STRONGLY RECOMMEND that you check to ensure that the use of a speed camera detector in other countries is also legal. To download and successfully update the Snooper Lynx GT LIVE's GPS speed camera database via a computer you will need a PC running either Windows XP (32-Bit), Windows Vista (32-Bit), Windows Vista (64-Bit), Windows 7 (32-Bit), Windows 7 (64-Bit) or Windows 8 / 8.1 (64-Bit) with an internet connection. Please note: the Lynx GT LIVE, as with all Snooper products, is NOT MAC compatible. Want to add accessories to your Lynx GT LIVE? Though remember all the accessories listed above are included when you buy the snooper lynx gt from ActiveGPS. Question: I have a Snooper Lynx which has given me great service for several years now. I update the database online. I'd like to include France in my updates as I understand that French camera sites are in the Aura camera database? How is this possible please? Answer: To answer your question, please email support@snooper.eu. While we sell speed camera detectors, we don’t sell the AURA speed camera database subscription. Do you have a question about the Snooper Lynx? Submit your question via our contact page.